(Nanowerk News) Due to their nanoscale dimensions and sensitivity to light, quantum dots are being used for a number of bioimaging applications including in vivo imaging of tumor cells, detection of biomolecules, and measurement of pH changes. When quantum dots are introduced in biological media, proteins surround the nanoparticles and form a corona. 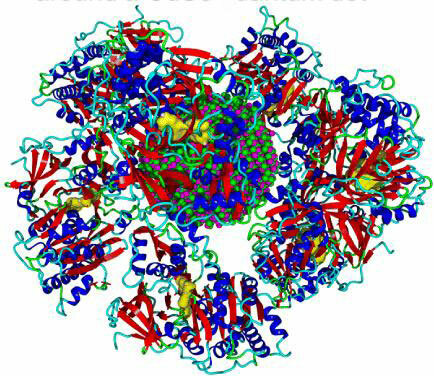 The formation of the protein corona changes the sensitivity of the quantum dots to light. Using the cadmium selenide quantum dot, researchers at Syracuse University collaborated to understand how protein corona forms and what is different about the quantum dot before and after the formation of the corona. Research performed by Professor Shikha Nangia, in the Department of Biomedical and Chemical Engineering, and Professor Ari Chakraborty, in the Department of Chemistry, resulted in the development of a novel multilevel computational approach ("Optical Signature of Formation of Protein Corona in the Firefly Luciferase-CdSe Quantum Dot Complex"). This method combines the strengths of quantum mechanics, molecular mechanics, classical molecular dynamics, and Monte Carlo techniques. Because of this work, it is now possible to perform computer simulation of protein-quantum dot complexes that were previously considered to be beyond the scope of computational investigations. Now that this methodology has been created, it can be applied to bigger and more complex quantum dot systems.